Rotary is a worldwide organisation of business and professional leaders who provide humanitarian service and help to build goodwill and peace in the world. Rotary’s global membership is approximately 1.2 million men and women who belong to more than 34,000 Rotary clubs in more than 200 countries and geographical areas. Rotary’s top priority is the global eradication of polio. The Rotary Club of Brookvale is a group of local people from all walks of life, all with a common goal – service through fellowship. It’s a great way to meet fellow professionals and make new friends. Our Club always welcomes new members. We are involved in many local, national and international projects. The Club’s major annual fundraising activity is the Pub2Pub Charity Fun Run & Festival – now in it’s 26th year! The Pub2Pub is the largest community and fundraising event on Sydney’s Northern Beaches. Our aim is for 100% of all registration fees to go back to local charities and service organisations. We are blessed with some generous sponsors who cover the necessary overheads involved with such a large event. If you feel like it’s time to give something back to your community or would like to meet like-minded business people, we would like to invite you to join the Rotary Club of Brookvale. Come along to one of our get togethers and we’ll show you what Rotary is about. 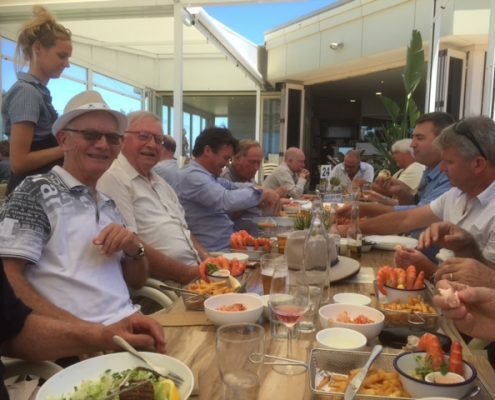 We have Lunch Meetings at 12.30 pm on the 2nd and 4th Thursday of each month at Manly Leagues Club Brookvale and BrookyLite Dinner Meetings usually on 1st Thursday of each month at Club Totem Balgowlah (For details contact President Ron Allars 0418 236 980). While members are encouraged to attend meetings on a regular basis, we do recognise that everyone has commitments other than Rotary and therefore do not insist on attendance at every meeting. To find out more about about how you can be involved in our Club, please contact us.